We started life as One Care Consortium Limited, set up as a vehicle to deliver the GP Access Fund programme between April 2014 and 31 March 2017. Our members consisted of GP practices across Bristol, North Somerset and South Gloucestershire plus two local provider organisations, BrisDoc and GP Care. Our vision was to collaborate to cultivate innovative and responsive seven-day primary care. The below document gives an overview of the projects that we were engaged with piloting over the three years of the GP Access Fund. The GP Access Fund was initially known as the Prime Minister’s Challenge Fund. The Challenge Fund’s call to action identified that practices need to work differently, to provide patient-focused and accessible services – including tailored services for vulnerable and diverse communities – and ensure that services are sustainable for the future. One Care Consortium was named as one of the PMCF Wave One pilot sites, along with 19 others. On 30 September 2014, the Prime Minister announced a new second wave of access pilots, with further funding of £100m for 2015/16. One Care Consortium submitted a bid for PMCF Wave Two funding and were successful in securing a further £4.4 million from the Prime Minister’s Challenge Fund (PMCF) Wave 2. 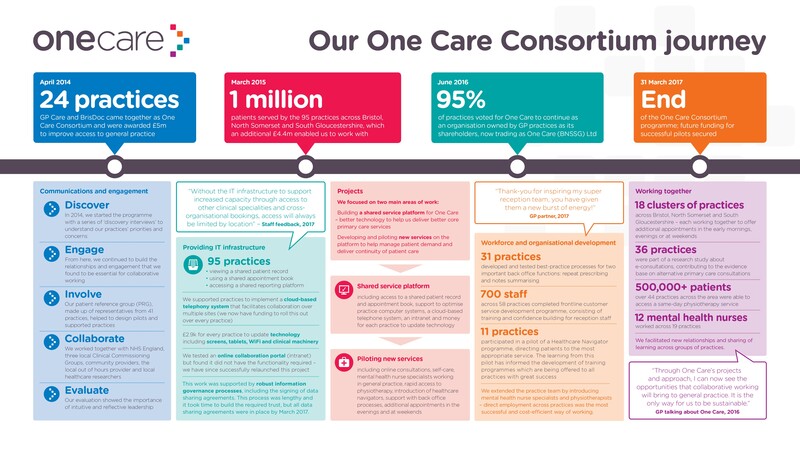 One Care Consortium was one of 37 PMCF Wave Two pilot schemes which have been chosen to lead the way in testing innovative ways of increasing access and delivering wider transformational change in general practice. You can download a full list of the PMCF Wave 2 sites on the NHS England website.